It is hard to believe that fall is upon us but here it is and with it brings the annual family law conference where divorce attorneys, mediators and Judges gather to learn about the latest cases and procedures. For the past several years, the conference has been held in Lincoln City, Oregon but this year the conference has moved to the Sun River Resort here in Central Oregon. I am really looking forward to the conference as two of our Deschutes County Judges will be speaking. Judge Ashby will be discussing the Informal Domestic Relations Trial and how it works in our county. In addition, retired Judge Sullivan will be speaking on how to have an effective settlement conference in your divorce case. It will be wonderful to catch up with fellow family law lawyers who will travel here from around the state. It is always a productive time to go over cases and strategy. I especially enjoy talking with the attorneys from Portland, Salem and Eugene who practice collaborative law like I do. There are a group of us in the state that promote mediation over litigation. Obviously, in some divorces, a trial is the only answer but for the vast majority of cases, mediation and negotiation and collaborative law work well. There will be a speaker who will discuss Marijuana’s Impact on Family law and how we deal with cases. What if a Mother and Father are running a pot farm and they are divorcing, are children at risk? How will parenting time look? How do you determine child support when it is a cash business and no income records to produce? There are a lot of questions with the new industry in our state and how it affects families. There is a talk on “Tips for Staying Out of the Manure: How to disentangle spouses when the family farm is part of the marital estate”. I like that my fellow attorneys can keep a sense of humor in regards to divorce law. There will be a talk on QDRO’s (dividing pensions, 401K’s etc). That is a great topic to learn about. While I will be taking time away from my law office, I will be becoming a more informed divorce attorney through these classes. It is often said that family law lawyers have to be a jack of all trades in that we need to be well versed in child custody, spousal support, property law, business law, estate and inheritance law, bankruptcy and even tax law. 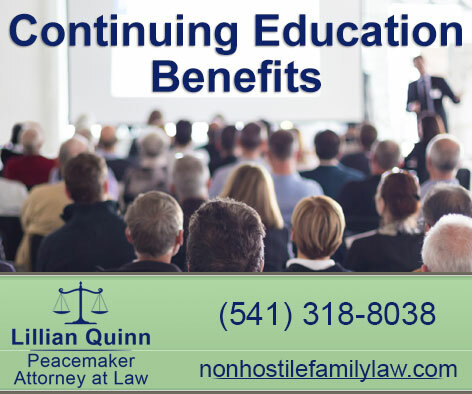 Attorneys are required to do continuing legal education courses (45 credits) and we report to the Oregon State Bar every three years. This requirement makes sure all of us stay up to date with the latest case law and procedure. The Family Law Section is top notch and always has excellent speakers. I know I will learn a lot.